The Stolen Generation was not only stolen from their mothers, fathers, brothers and sisters but from their extended family, their indigenous language, their culture, their right to land, and their identity. Many white Australians are able to easily access their family history but indigenous Australians removed from their families can face a hard task. Many remember being forcibly removed from their homes and hiding in bushland. They may also remember years of abuse in homes and with foster families. But knowing who to turn to when looking for their families and their home can be difficult. 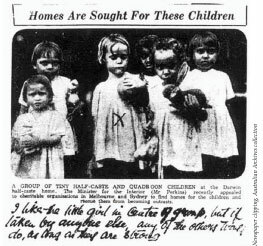 For people in the Stolen Generation there are significant hurdles when looking for their family history. The ability to find the documents that may have been gotten rid of to hid the shame of this era from 1909 to 1969. The records may be heartbreaking in what measures where taken to keep the children from their families. (Some people have found letters written by their younger selves begging to see their mothers or letters written by their families asking about them when they were told their parents didn’t care. )The written records may also contain very conflicting and denigrating information that can be hard for an individual to take. This is apart from the ability to know where to look and how to research a family tree. In 1980, Link up was created in New South Wales, since then all states have their own Link up offices that you can find on the internet. Link up Queensland http://www.link-upqld.org.au/home.html was started in 1984 and their website states that this was in response to concerns in the Aboriginal and Torres Strait Islander communities and what the removal of children had done to the mental health of it’s members. What Link up provides is support for the Stolen Generation in tracing their Aboriginal and Torres Strait Islander family. But it’s not just finding relatives, it’s the support in counselling that I think is the greatest part of this equation. The healing process from not only finding and knowing your family doesn’t just happen with seeing them but understanding what happened. The Link up service doesn’t offer a genealogy service where they trace back generations of your family. They are wanting people to reunite with their immediate families and they facilitate by also helping to organise reunions. Link up is a free service and they offer emotional support before, during and after the reconciliation process. They also offer opportunities for the Aboriginal and Torres Strait Islander communities to get together with Healing camps, Music workshops and events like National Sorry Day and NIDOC events. I don’t have Aboriginal or Torres Strait heritage but I understand what it feels like to belong to a family and my own heritage. The question of Who am I? is something we all work out ourselves but it surely is easier with knowing our own families. It is heart warming to see yourself or loved ones in younger and older family members. It’s that passion for the water that you find in generations of your family. Tracking down your family history can feel like a hard lonely road sometimes when your sitting in front of a computer or in another library but it opens up at the end to lots of people. I hope that researchers at Link up see that their work opens up to many families bringing their children home. Last updated by Nicol Warren at May 20, 2015 . Aboriginal and Torres Strait Islander ancestry, Link Up, Stolen Generation. Bookmark. What to do with your family history or memorabilia?